When I was little we’d go to the beach. Dad would let us splash in the waves. I could feel the pull of the current against the sandy bottom under my feet. 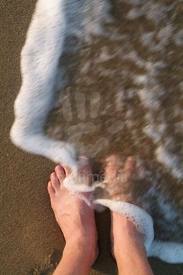 But, if I dug my toes in deep, I could stay upright when the waves crashed to the shoreline. The water swirled around my ankles like a rope ready to yank me down, but I didn’t wobble because my toes hung on tight underneath the sand to steady me. We all know people whose actions just don’t jive with their church-talk. They can quote Scripture like a pro, but they are mean in spirit, harsh in tongue and negative in thought. They let the waves of life crash around them without getting a firm grip onto what they have been quoting. But, at times when life bears down on us like a the ocean current, can’t we all be like that? Sure. There has been only one perfect person who walked on earth and that path led to being hung on a cross for the rest of us. Are your faith-feet firmly planted in the Rock so that you will not wobble no matter what blows your way or floods your thoughts today? Unless you have His words in your heart and on your mind, your actions will be shaky. Whatever life throws at you may topple you like a wave. You need a constant reminder of His love for you and that He is in control, if you let Him be so. It may be a cross on a chain you feel next to your skin, or a saying taped to your computer, a hymn that you hum in your mind, or a rainbow breaking through the storm clouds. We all need something we can dig our toes into so when life happens we do, think and say what we know our Lord would approve. What do you dig your toes into?